Christmas is one of my favorite seasons. We begin decorating French Pemberley the day after Thanksgiving, and spend the next several days putting up the Christmas trees (there are 3), hanging lights, and blanketing the house in merry décor. This year, however, the week after Thanksgiving found me on holiday with the entire family in San Diego for a week; the last trip of mine for 2014 (as I write this, Darcy is on a short trip to NYC–Christmas shopping). 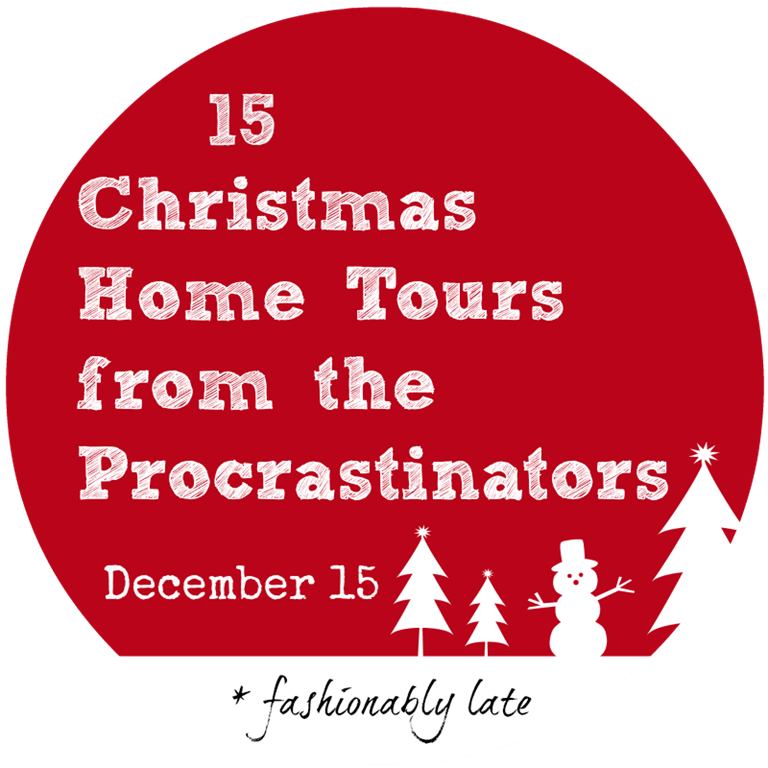 The race has been on to get the decorations up, and even though I am posting a short home tour this morning, I am still doing so…welcome to the Procrastinator’s Christmas tour. 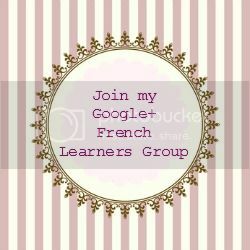 I am joined this morning in this tour by 14 other lovely blogs. After the photos, please be sure to enter the rafflecopter giveaway for your chance to win $50 gift cards from both of the tour’s generous sponsors, OnLineFabricStore and Farmhouse Decor Shop. In November we did a huge remodel to our fireplace. This, coupled with the kitchen transformation we did last year, has made the living/kitchen open area the focal point of our upstairs, so our main decorating efforts holiday wise are focused there this year. The fireplace transformation was nothing short of miraculous; 4 weeks ago, this wall, fireplace and hearth were all heavy red brick. I have a small Nutcracker collection. Darcy picked up the bagpiper for me on a trip he took two years ago to Germany. We were married in Scotland. This was part an anniversary gift that year. I loved it. The main living room tree is the pièce de résistance of the upstairs. It is 8 ft tall and covered with ornaments from our various travels. Ornaments are one of my favorite souvenirs. (I will be sharing some of those in their own post later this week, so please stop back by). There are lots of different favorite Christmas knick-knacks now sitting about on dressers, side tables, and bathroom vanities. And two other trees adorn the kids’ spaces. Another tree in the shared girls bedroom, and this one downstairs in our homeschool room, covered in all the homemade ornaments the kids’ have made through the years (along with some cheap ones that little hands can hang independently without parental fear of breakage). I’m still wrapping up decorating this week in the master bedroom and the dining room and the kids and I have plans to decorate some of the trees with some bird seed ornaments we saw in a “how-to” on pinterest. Darcy hung up the lights on the exterior of the house before he left for NYC. Some other favorite elements of our Christmas décor that I love is going on the dining room table today…all the framed photos of the kids from visits to Santas past. A table of memories, that I could linger over all season. I hope you’ve enjoyed this tour of our Christmas décor here at French Pemberley this year. Now on to the giveaway. 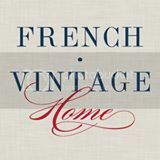 Please enter to win a chance to win one of two $50 giftcards from our generous tour sponsors, OnLineFabricStore and Farmhouse Decor Shop. I'm ready to move in! Just make a bed for me near that sweet tree with the homemade ornaments and the shelf full of Christmas books. Goodness love the fireplace and the Christmas decor. Love your Christmas decor!! The bagpipe nutcracker is too cute! Love your wreaths. The plaid skates and the feathers are nice touches. books by the tree… perfect! Love a better-late-than-never tour! Wonderful! I'm loving this Holiday Home Tour. Like to see how others decorate. Great fireplace. Everything looks wonderful! I can't believe the beautiful fireplace transformation. It turned out beautiful! Thank you for the lovely tour! Merry Christmas! lol, love the chicken coop wreath! Your tree is amazing. I love all the lights, but the note from your husband is the sweetest. I like the idea of a Christmas book display! 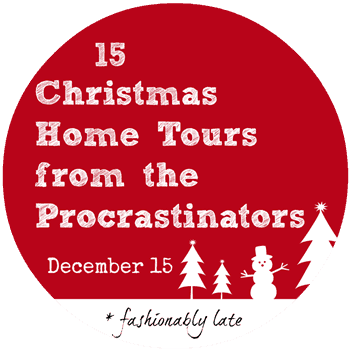 So enjoyed your Procrastinators Christmas Home Tour. I loved how all of the pieces have a significant meaning! What a fabulous idea to pick up souvenirs from your world travels. I too have a nutcracker that I purchased while travelling through Germany. Merry Christmas! Thank you! It is small, but growing. My favorite of course is the Scottish Bagpiper nutcracker, but the little dentist comes in a close second! Thank you. We got that greenery and the matching lighted greenery along the fireplace at Costco this year! Thank you; the little plaid skates hung on our door alone for 3 years. This year we bought a big wreath to hang around them. I love them because we bought them the first year we lived in this house, 2010, and they have 2010 engraved into the wooden skate blade, so a nice reminder of how long we have been here at the French Pemberley home! I know! So often I have found one or more of the kids sitting around it reading through the Christmas themed story books. Terri, thank you so much. I love the kitchen too; and being a family of 7 I spend a lot of time there cooking when we are home. I have several photos of kids with Santa past still to frame, but my goal is pick up the rest of the sized frames I need through the year (hopefully picking some up on sale) and then making a large collection of them either on the kitchen bar or the dining room table. People always love looking at those pictures and guessing who is who or commenting on how big the kids have gotten. Be watching for my post coming up that shows the Before/After transformation of the fireplace; you just wouldn't believe what it looked like before. Thanks for your sweet comment! He's my favorite too since I was married in Scotland! If you look close at the wreath hanging on the coop, the feathers are actually part of these little bird clips I bought and them clipped around it. They turned a very plain Walmart wreath into something very special with very little effort. I love having wreaths. I have 4 different ones for the front door I rotate, including a really awesome Edgar Allen Poe, The Raven themed Halloween one I made a few years ago. That little bookcase was the best money I ever spent for our homeschool. I kind of went back and forth if it was worth $129 amazon at the time but it is made great (no cheap wood) and so every month, whatever the holiday or theme we can pull the books we have that “match up” and display them there. I never fail to find a child sitting in front of it flipping through or reading books, no matter what time of year. But, I especially love it during Christmas time when the tree is up! I know! I was so happy to be included! Thanks for stopping by! The coop is new, but awaiting our painter to get back from wherever he is so he can paint it and I've ordered some cool things for it so it will be pseudo decorated year round. We have a small flock, a head hen and 5 other hens, named after the Bennet's in Jane Austen's Pride and Prejudice. Head hen is Mrs. Bennet, and the others then are Jane, Lizzie, Mary, Kitty and Lydia. Not typical names for chicken's but anyone whose read the book thinks it is delightful! Thanks so much. 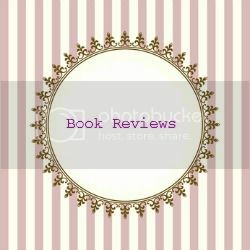 I always get such great ideas from everyone when I visit their blogs and see how they did it. Stay tuned for an upcoming posts that shares the before and after pictures of our fireplace transformation; you won't believe it is the same one! Thank you so much. It was so nice to be included in this home tour and get to meet so many new people and find new bloggers to follow. I love getting such wonderful ideas from everyone. Sherry, thank you so much for your sweet comments (Sorry I am just responding…holidays…crazy). I never took the tag off the Santa cookie jar because what Darcy wrote on it was just so sweet…he really outdid himself with my new kitchen surprise. It was so fun to be included in the home tour! Please stop back by the blog again. I have many things planned for the new year. 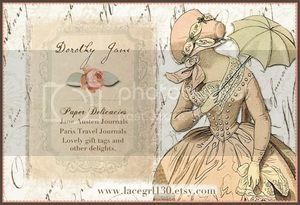 I know…I couldn't help myself.. Mrs. Bennet and her daughters deserved a little décor too! They were awesome. Regular chocolate cake mix but added in some doterra Peppermint Oil (the only EOs you can use in your cooking safely), so not only did they taste good but they had some added helath benefit from the oil! I thought that note was so sweet; he totally outdid himself on the new kitchen surprise. I love all the lights too…lots of lights and lots of candles really add to the magic of the season! I didn't photograph it, but upstairs, in our main living room, there is a basket that holds all of my previous Christmas themed magazines…think Martha Stewart, English home, etc…so enjoyable to flip through them each year! And magazines are so expensive nowadays; it's nice to feel you are getting your money's worth out of them by using them over and over as the holidays pass. Nutcrackers are just so fun, and my daughter is a ballerina so she dances the Nutcracker every year. Love ornaments as souvenirs; makes the tree extra special and a great way to reminisce about previous adventures whether they were close to home or far away.